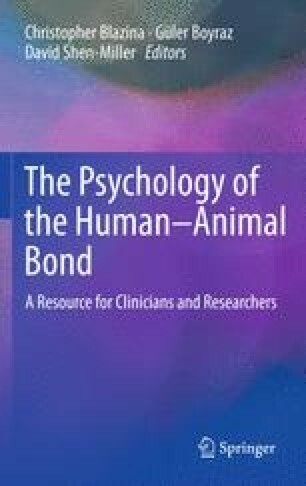 The purpose of this chapter is to explore the psychological nature of the human–animal bond, using a theory called self psychology. In self psychology, animals who serve an essential function in maintaining a person’s cohesion and psychological well-being are said to be serving a selfobject function. Companion animals can provide any of the three selfobject functions—mirroring, idealizing, and twinship. This chapter gives examples of these three types of selfobject functions and explores special qualities of animals that may enable them to fulfill these crucial functions for people. The chapter’s selfobject questionnaire is designed to help reveal what type(s) of selfobject relationship(s) each animal provides. The difference between a mature and an archaic selfobject relationship is also explored with the example of the animal hoarder. This work was funded in part by the Department of Health and Human Services’ Health and Services Administration, Bureau of Health Professions under Tuskegee University’s Center of Excellence Grant. Select one specific animal to answer the questions. You may select animals that are alive or deceased. If you have more than one animal, complete the quiz separately for each one. Part I: Is your animal a selfobject? Would you feel devastated if you lost your animal? Would you feel a sense of falling apart or have trouble functioning if you lost your animal? If your answers to both questions in Part I were true, then your animal is probably a selfobject to you. If so, continue to Part II. If you answered only one as true, continue on as they may still be a selfobject. Part II: What type of selfobject is your animal? Answer the following questions to find out what type of selfobject your animal may be. Circle T for True and F for False. Does your animal give you a feeling of being loved, special, treasured or important? Would you say your animal calms, soothes, comforts or reassures you? Does your animal make you feel loved and accepted in spite of any flaws or imperfections? Does your animal make you feel vibrant, invigorated or energized? Do you feel your animal sometimes shares in your emotional states, reflecting back to you your own happiness, sadness or other emotions? Do you feel stronger (psychologically or physically) when near your animal? Do you feel proud when out in public with your animal (or showing photos of your animal) or when other people admire them? Would you say your animal has abilities or qualities that you wish you had or you admire? Do you admire your animal’s strength, power, confidence or assertiveness? Do you perceive your animal as having a stable, calm, non-anxious, powerful, wise, or protective presence? Would you say that you consider your animal to be a soul-mate or that you have a special kinship with him/her? Do you sometimes feel a sense of being one with your animal? Does it seem to you that you are similar to your animal in some meaningful and deep way(s)? Do you feel an unspoken capacity to know and understand each other’s inner states? Do you believe that you and your animal are often thinking the same thoughts or that you can read each other’s minds? Add 1 point for each True item above. Add item points for each type of selfobject to obtain the 3 sub-totals. The highest sub-total number is an indication of which type of selfobject your animal is for you. It is also possible that your animal is more than one type of selfobject. Patronek, G. J., Loar, L., & Nathanson, J. N. (2006). Animal hoarding: Strategies for interdisciplinary interventions to help people, animals, and communities at risk. Boston: Hoarding of Animals Research Consortium. Available at: http://www.tufts.edu/vet/cfa/hoarding/pubs/AngellReport.pdf. Accessed Sept 16, 2009.